Rick and Tom O’Neal are writing a book about Tom’s years photographing rock groups. Tom created 70 album covers in the ‘60s and ‘70s. This is a sample chapter about this photograph, where the neighbor’s dog walked into the picture unexpectedly while the band members were frozen in a long pose awaiting the lengthy exposure of the antique camera. The idea for the Déjà vu album cover came from Stephen Stills, an impassioned Civil War buff. Stills wanted the photo to look like a Civil War era tintype. 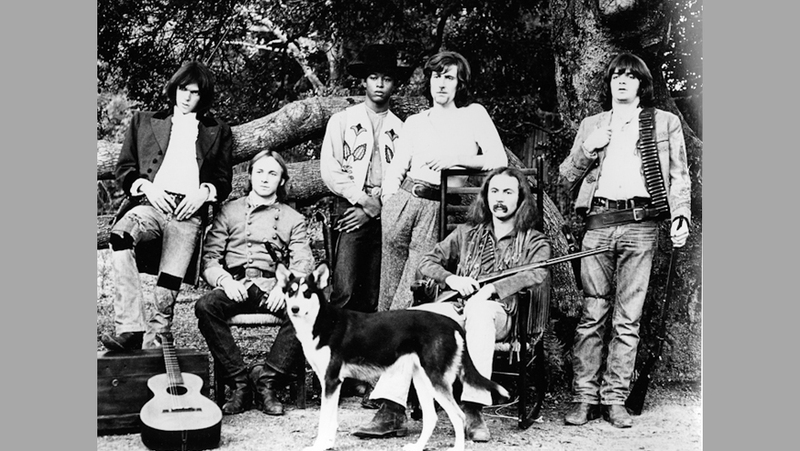 Tom Gundelfinger (who later changed his last name after marrying Mollie O’Neal) had been shooting photos of CSN&Y since they first formed the band, long before the four had ever performed in public. They didn’t think of themselves as a group but more as a gathering of musicians who would come together occasionally, make a little music and then go their separate ways. Déjà vu was their first album to include Neal Young. Cover designer Gary Burden contacted Tom about shooting the cover, which at the time had no working title. 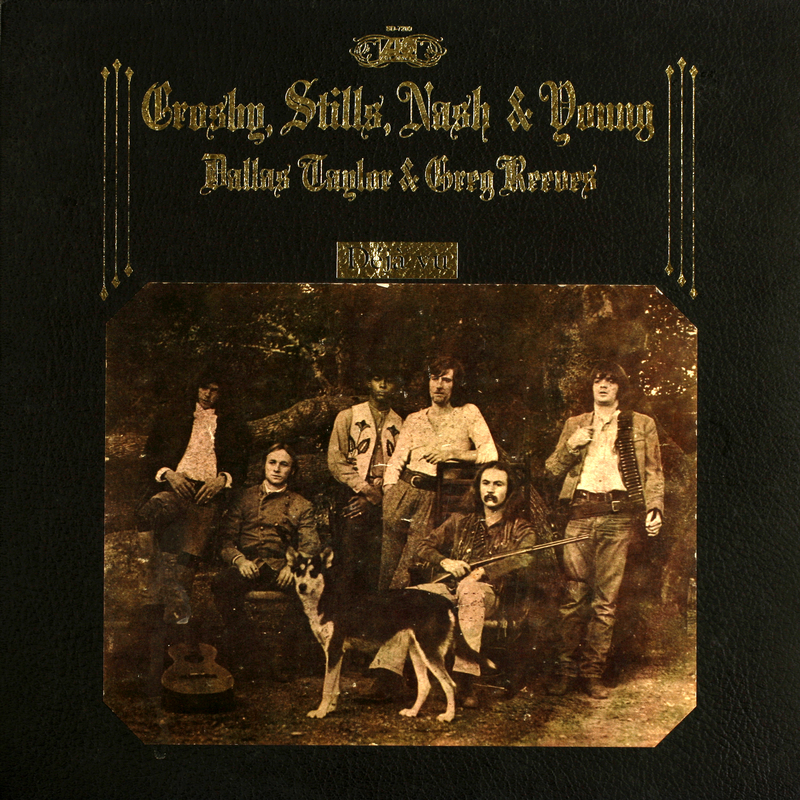 After the shoot, the album was named for David Crosby’s side-two song, “Déjà vu.” Both Gary and Tom were surprised at how well the cover idea worked with the title. Tom researched cameras used by famed Civil War photographer Mathew Brady and found a similar one in a Los Angeles camera store. It had been used as a movie prop. “I read up on the chemical process for making photos on tin plates, which required a light-sensitive emulsion and several chemicals to complete the process,” Tom said. For the short flight from his home in Santa Monica to San Francisco, he stowed a leather case with six amber bottles of chemicals under his airline seat. (Try that today!) He then drove the 30 miles to Crosby’s rented house in Novato, north of San Francisco, and converted Crosby’s guest bathroom into a makeshift darkroom. The session did not begin until early afternoon because the band had been recording almost all night at Wally Heider’s San Francisco studio. They had slept in and met for a late breakfast before gathering for the shoot in front of a large tree in Crosby’s backyard. Each had rented costumes from Western Costume in Hollywood. David Crosby dressed as Buffalo Bill Cody. Stephen Stills was a Confederate soldier. Neil Young was a gunfighter. And Graham Nash dressed as a pipe-smoking laborer. Drummer Dallas Taylor and bassist Greg Reeves also joined the shoot. Cover designer Gary Burden was art directing. “He and I corralled the group and had them take their positions. For the first shot, Crosby lounged on a tree limb in the back. I set up four cameras on tripods: the antique camera, a medium format camera and two 35 mm cameras. I told everyone I would be moving from camera to camera during the long exposure but they were to focus only on the antique camera. The band members take a break between shots. 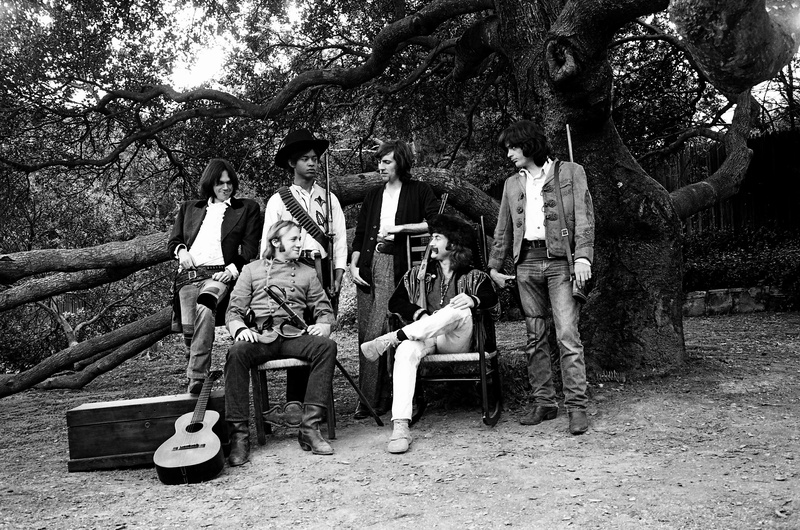 For the second exposure, Crosby sat in a chair surrounded by the band. It was during the second shot that a neighbor’s dog wandered into the shot. They decided to use one of the photos from the first shoot where Crosby was sitting in the tree. But the band members turned it down because the brim of Crosby’s hat shaded his eyes. [An original print of this shot was chosen in 2012 to become part of the permanent collection at the Smithsonian Institution’s National Portrait Gallery.] The band looked through other finalists until it settled on a shot of the neighbor’s dog wandering into the frame. “To give the image an authentic feel, I decided to reproduce it using 19th century techniques. From the 35 mm black and white Plus-X negative, I created an 8×10-inch master negative. I found some porous poster board that would accept a chemical emulsion that was originally formulated by English photographer Henry Fox Talbot in the 1850s. “I placed the negative on top of the emulsion-covered board in a contact printing frame, walked out on the front lawn of my Santa Monica studio and held it up to the sun. I watched the image gradually emerge over the next five minutes. This was the image that I gave to Gary Burden for the final design layout. “Unfortunately, due to the instability of the chemicals, the original image lasted only a year before fading into eternity. But that did not keep it from becoming one of the most iconic photos in rock ‘n’ roll history. At the time, the cover was the most expensive ever produced. Each photo was hand-glued onto heavy leatherette paper manufactured at a family-owned paper mill in Georgia. This was a time when album covers were considered works of art. Because of its initial cost, it was a good thing the album was among the best selling of 1970. Two years after the shoot, Gary Burden asked to borrow the negative for some collateral materials for the band. Tom never loaned negatives, but Gary was a good friend so he sent it to him. Nobody is sure exactly what happened, but Burden lost the film. For more than 27 years, Tom thought the negative of one of his most famous album cover photos, had been lost to a landfill somewhere. After such a long time, he figured it would never be found. But then in 2000, Joel Bernstein, an archivist who was gathering up years of CSN&Y material, called. “Tom,” he said, “I have some good news for you.” The negative had been misfiled for decades. “Hang on,” Tom said. “Don’t let it out of your sight.” Tom drove from his Carmel Valley home that night to Berkley to retrieve the most important piece of film he had ever shot. Today, it has been scanned for posterity, and the original is locked in a vault for safekeeping.